Health Risk Assessment is a tool to calculate your wellness score & predict your health risk in various different areas. 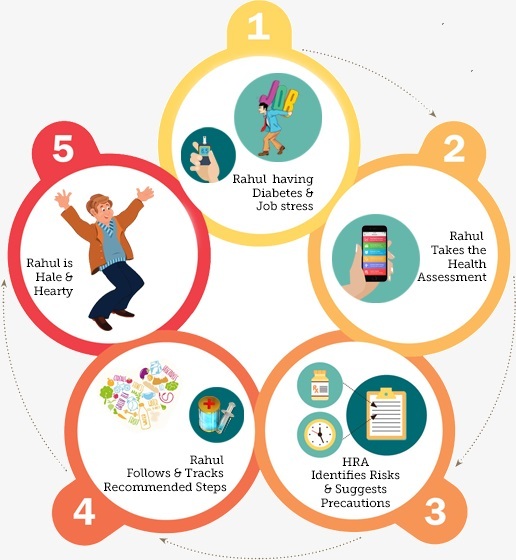 HRA is a simple questionnaire based on your current health, family health history, lifestyle and social health. The more accurately you answer those questions the more accurate the risk prediction will be. Once you take the risk assessment, you would receive a Wellness Score. This score indicates, when it comes to health, how well you are doing as compared to your peers. You could consider it as an indicator of where you stand in your health journey and what improvements you need to make, in order to move to the next level. If you are worried about or unaware of your health risks, the Health Risk Assessment tool is just what the doctor ordered. The tool would assess your risk to 13 different health conditions and make you aware of health areas that you should pay closer attention. Post the assessment, you would receive a completely personalized health plan. It is based on your responses, identified risk areas and your profile. The plan would help you with some immediate steps to ensure your health and same time provide tips on how to manage possible risk areas. Why is Health Risk Assessment required ? The various lifestyles we lead today often threaten our long-term health. Habits and behaviours such as poor diet, smoking, lack of exercise, stress levels are among the common factors that bring an individual to high risks of premature death or getting ill. However, knowledge of the presence of these risks does not always make a change in behaviour, people are not aware of which risks need urgent attention. Undergoing 'Health Risk Assessment' can reduce risks by health education. It primarily motivates and sustains health behavioural changes to improve the population’s health and productivity hence cutting on health care costs. What is expected out of this exercise? Wellness score: this indicates how healthy you are. Risk Status: Low / Medium/ High risk in 13 different health conditions. Personalized Report: As no two human being are same and so as their health conditions, hence we try to make sure that no two health reports are same. It is personalized to your healthcare needs. How to prepare for Health Risk Assessment? There is no specific preparation you need to do for Health Risk Assessment (HRA). If you have done health check-up before taking HRA(Health Risk Assessment), it's better that you keep those records with you and update the numbers in the systems. It will help you getting more accurate result. Do I need to answer all of them in one sitting ? No. You can save your responses, exit the HRA and then log back to it at any time. When you log back, you would not be required to retake the HRA, but, start at the point where you had last left. How long does it take to complete the Health Risk assessment ? It takes 10-15 mins to complete the Health Risk assessment. How authentic these risk scores are ? Most of these risk are calculated based on evidence based models used across the world. There are certain parameter tweaked in Indian context. What should I do if the tool predicts some Risk ? What if I already have certain health issues ? This too is designed to manage Risk as well as diseases. We provide you option to store your health records, set reminder for medication, search health check-up package. Having any disease does not restricts you from taking Health Risk Assessment. You can still complete HRA and check the co-morbidies and the wellness plan.